Very similar to the "Empire" and "Efficient" Burge Warren and Ridgley syringe fillers, this pen seems to have been made for a stationer as an "own brand" pen.The pen is identical to the BWR pens, with the same acorn shaped end to the syringe plunger rod. The other major clue to it's origin of manufacture is the use of the peculiar gothic type face on the instruction leaflet, which BWR used on many of their boxes, leaflets and advertisements. 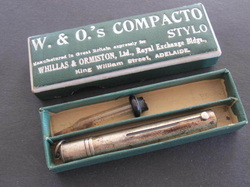 This is a boxed Neptune Compacto stylographic pen made by Burge, Warren and Ridgley for Whillas & Ormiston Ltd in Adelaide, Australia. Compactos were made by BWR from 1914 through to about 1928, this version with a ribbon ring was introduced in 1917 and was priced at four shillings and sixpence in the UK. The Compacto range also included fountain pens and comprised either a hallmarked sterling silver or silver plated case covering a black or red vulcanite pen which when opened telescoped in length on a slide mechanism. This is a Neptune Empire Self Filler, which is one of a number of syringe filling pens that Burge Warren & Ridgley had on the market in the early years of the twentieth century. It differs from the Efficient syringe fillers by having a slip cap rather than a screw cap. The pen is similar to the "Post" pen and examples made for and marketed by W.H. Smith. Robert Pringle the UK's leading jewellery wholesaler also had a syringe model not unlike this which they sold under their pen brand The Battle Axe pen. 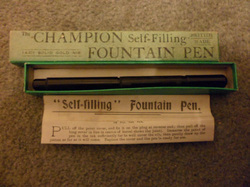 First marketed in 1923, this pen with a unique vacuum filling system seems to have had relatively short lived existence. 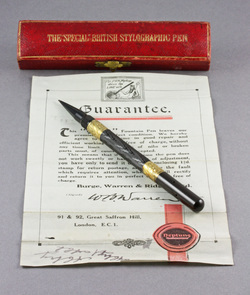 The last known trade advert for the pen is dated August 1925. The Push-Fill Neptune was marketed in four different versions each at varying prices: 44 (5/6), 44A (8/-), 44B (10/6), and the 44C (12/6). After the manufacturing side of BWR transferred to The Jewel Pen Co in 1929, the latter produced and marketed the Neptune No. 7 in a range of highly attractive coloured plastics. Three examples are known so far: pearl and black, and the two shown here in green and black, and green and red. No doubt there are many other colour ways yet to be discovered.